Level 8 Craftling: Make a sweatshirt into a zip-up! 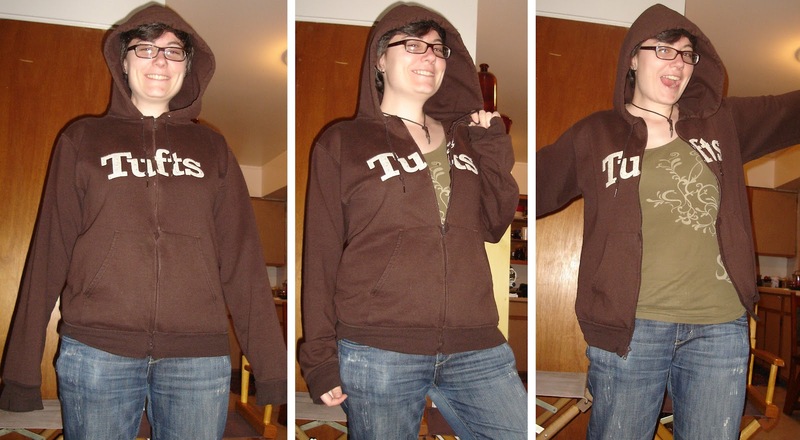 Make a sweatshirt into a zip-up! 2. Lay the sweatshirt out flat and measure the distance from the the bottom to the neckline - mine was 23 inches long. 3. Buy a zipper! I got a 24" sport zipper from JoAnn's for under $4. 4. If your hood overlaps at the neckline like mine does, you need to seam rip out a couple inches of the hood so that you have a clear area to cut. The hood overlapped at the neck - need to seam rip this first. 5. Measure the center of the front of your sweatshirt, assuming you want to cut up the center (if your sweatshirt doesn't have a hood, maybe you could make a funky zipper to the side of center). I did this by marking the center of the bottom and top lines of the pocket, the center where the hood came to the neckline, and the center between the arm seams. I do all my markings with chalk - I bought a simple little bucket of chalk in different colors at the store, and it works wonderfully! You don't need tailor's chalk in the special rolling case that makes really sharp lines if you are careful with normal small chalk sticks when marking (and if you mark incorrectly, simply rub out the part you don't want!). 6. Next, I was able to slide my cutting board in between the layers of my sweatshirt - this helped it lay flat and straight and meant I could use my roller cutter. Lay out a straightedge of some kind - best is a long transparent measuring board, but a yard/meter stick would work great, too (or a ruler if you are careful and do several markings). I put my clear measuring board over the area I wanted, and I had to carefully tug my sweatshirt to make sure my line went between the Tufts letters before I marked my line. 7. Cut along the line you marked! Eep! 8. Separate your zipper halves and carefully pin them to the sweatshirt - I had a pin about every inch. You'll want to pin it so that the front of the sweatshirt just barely covers the zipper ridge (but completely cover it, or else the zipper will peak out of the finished sweatshirt). Make sure that the beginning and end of your zipper sides match up, and that the letters on your sweatshirt are also on the same area of the zipper. I forgot about matching the letters, so mine are a little off (I might rip this out and redo this later). See? The "f" is a little higher than the "u" - oops! 9. Switch your sewing machine's foot to a zipper foot - it looks like half a sewing foot and allows you to get closer to the zipper. 10. Sew your line! Put the foot down next to the zipper and see how far from the zipper you have to sew to not be on top of it - I ended up sewing about 3/8" from the edge so that I didn't hit the zipper. 11. Switch your top thread's color when you reach the lettering, if you need to - I switched to a cream-colored stitch to go over the letters so that I don't have an ugly brown line down the edge of my "u" and "f."
12. Re-attach the edge of the hood at the collar if you needed to seam rip it. I had to fold under the edge a bit (the part that used to overlap) and sew it under before sewing it back to the neckline, and then I did a little hand sewing to make the two halves of the neckline look even (it was slightly off). And you're done! All told, this took me about an hour after I had purchased the zipper. Now, it will take me a little more time at some point to rip out the seam near my letters and adjust them so that they are even, but for now it works great. 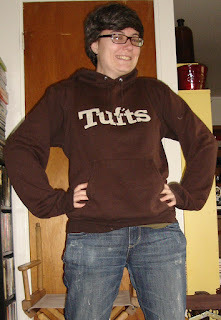 I've been wearing my new zip-up Tufts sweatshirt for two days now, and I love it! All done! So nice to be able to control my temperature better now.